Sühs KW, Papanagiotou P, Hein K, Pul R, Scholz K, Heesen C, Diem R.Disease Activity and Conversion into Multiple Sclerosis after Optic Neuritis Is Treated with Erythropoietin. Int J Mol Sci. 2016;17(10). pii: E1666. Changes in cerebral lesion load by magnetic resonance imaging (MRI) in patients from a double-blind, placebo-controlled, phase II study on erythropoietin in clinically isolated optic neuritis (ClinicalTrials.gov, NCT00355095) were analyzed. Therefore, patients with acute optic neuritis were assigned to receive either 33,000 IU of recombinant human erythropoietin (IV) daily for three days, or a placebo, as an add-on to methylprednisolone. Of 35 patients, we investigated changes in cerebral lesion load in MRIs obtained at baseline and at weeks 4, 8, and 16. In 5 of the 35 patients, we found conversion into multiple sclerosis (MS) based on MRI progression only. These five patients had received the placebo. Another five patients showed MRI progression together with relapses. Three of these patients had received erythropoietin, and two the placebo. Yet, analyzing the change in absolute numbers of periventricular, juxtacortical, and infratentorial lesions including gadolinium-enhancing lesions, there were no significant differences between the groups. Although effective in terms of retinal nerve fiber layer protection, erythropoietin treatment of acute isolated optic neuritis did not influence further evolution of MRI lesions in the brain when comparing absolute numbers. 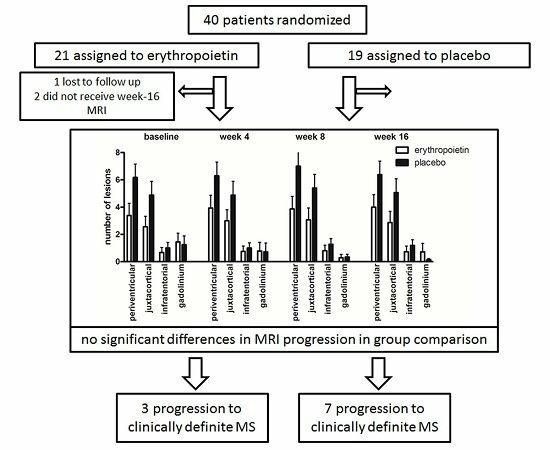 However, early conversion from clinically isolated syndrome to MS assessed by MRI activity seemed to occur more frequently in the placebo-treated group. It has been suggested that erythropoietin is a neuroprotective drug, which is indicated in some studies but not all. In some studies they get people on drug within 7 days of the optic neuritis, 4 weeks is too late I think for it to be of real value because the damage is done by that point, so I doubt that optimum neuroprotection was achieved. However in this study they ask do people progress from optic neuritis to MS. The answer is yes, but is this surprising? A neuroprotective saves nerves, but erythropoietin it probably is not an immunosuppressive, which is what you need to stop MS from progressing so you need a DMT and erythropoieitin isn’t a DMT. This further shows that to get on top of MS we need to deal with inflammation as a core to the base of the treatment pyramid then we can layer neuroprotection on top (this is what we are attempting to do with the PROXIMUS trial). You need both neuroprotection and DMT for a more optimum effect, then you can layer repair agents. So let's just say at some point there will be a neuroprotective for MS. How are we going to be able to afford it? I am from the US where costs don't seem to matter for healthcare (they will soon enough as healthcare soars in cost), but for the NHS costs sure matter. The cost for treating MS in the US could approach 100k a year for a DMT, a neuroprotective, MRI's, etc. Let's just say the NHS bargains a much better price than the US does (which they do), how will the NHS still pay for the extra costs? If they are already starting to ration Lemtrada, wouldn't they ration neuroprotectives too? I am just a concerned person with MS from across the pond that wants to see people get the best healthcare possible. How do you see this playing out? Law passed by lobbyists forbid u.s. medicare from negotiating while VA can negotiate. It's a crooked system. "Other countries act more like the V.A. than Medicare. In Britain, drug makers that won’t negotiate won’t be able to sell any drugs at all. That’s real leverage, but it also means that patients in England don’t have access to all the drugs that older people in the United States might want to take." If MS is "inside-outside", the neuroprotection / stopping oligodendrocyte death should be first line. Everything else is addressing secondary/tertiary – ad infinitum – damage. Damage which may accelerate the primary damage, but still. Okay – so I personally don't agree with your pyramid. At all.